Irish law has a long tradition stemming from the middle ages, and was a series of judicial reckonings formed from native and church law. Much of it has to do with prescribed social strata, especially the upper ranks, which included not only kings and warriors but also the poets. 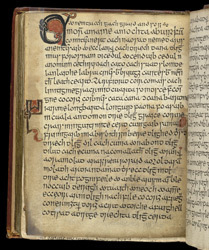 This late medieval law manuscript on privileged classes is said to have been copied by Matha Lúinin, a member of a renowned scribal family of County Fermanagh. It was made for Aimirgin who presented it to Mórann MacMain, a judge. Poets were a powerful group in medieval Irish society. There were many official grades of poet, beginning with the bards, who were untrained or 'natural' poets, and progressing to full-poets (or 'tsaois', meaning visionaries). Here Aimirgin is asked for a judgement on the number of followers there may be in a poet's retinue as he travelled the professional circuit of courts or visited places of importance.